1. 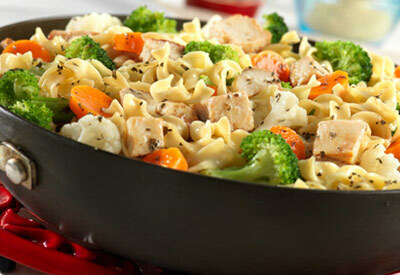 Heat the broth, basil, black pepper and vegetables in a 10- inch skillet over medium heat to a boil. Reduce the heat to low. Cover and cook for 5 minutes or until the vegetables are tender-crisp. 2. Stir the noodles in the skillet. Cover and cook for 5 minutes or until the noodles are tender. Stir in the chicken and cook until the mixture is hot and bubbling.